One bite instantly transports you to the sunny warmth of the Caribbean- even if you don't travel any farther than Rockville Centre or Smithtown. Maybe it was your honeymoon in Negril. Maybe a pre-cruise dinner in Old San Juan. Perhaps a destination wedding in Punta Cana. You tried the bright, vibrant, layered flavors of the Caribbean, you loved them, you had every intention of making them part of your life when you got back home. And then, nothing. Every year, Long Islanders flock to the Caribbean for R&R, and along the way fall in love with the food. But upon returning to this island, most find it difficult to recapture the magic. If you happen to be from the Caribbean, of course, you can make the foods of home yourself, or go to a steam-table lunch joint for all the rice and beans, stewed chicken, curry goat, salt fish and plantains you can eat. Caribbean takeout in enormous portions is the biggest bang for your lunch buck anywhere. But if you want a date-worthy, family-Sunday-worthy or girls’-night-out-worthy sit-down meal with proper silverware, Instagrammable food and potent, pretty tropical drinks, that’s been harder to find. Until now. Watch: Eat like you're in the Caribbean without leaving LI Most Long Islanders are living within a 20-minute drive of a truly authentic Caribbean dining experience. Over the last few years, a number of local restaurants have opened that feature island cuisine in charming, even glamorous, settings that will take you back to that last vacation, or forward into planning the next one. These restaurants are driven by immigrants who want the places they eat to reflect their assimilation into the fabric of Long Island life, and they also want to use food as a way to preserve their national and cultural identities, their taste memories of home. 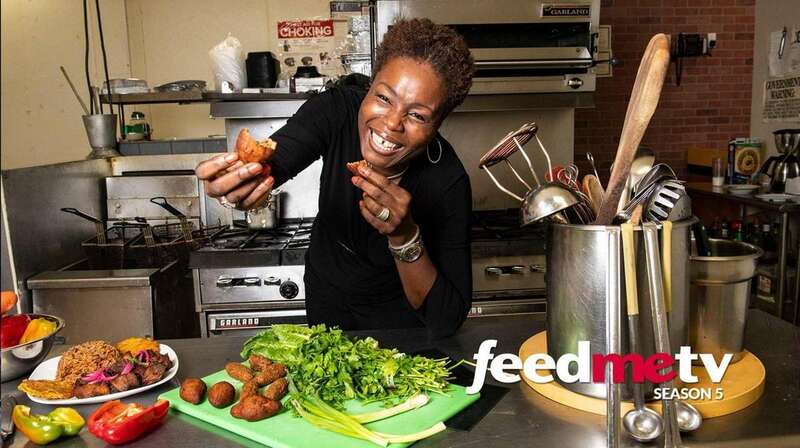 One such restaurateur is Naala Royale, born in Kingston, Jamaica, and a former vice president at Aramark, where she worked for more than 20 years. She now owns the hip Dunns River Lounge in Rockville Centre. “I’ve always wanted to get good Jamaican food at a nice table and not do takeout, maybe hear a nice reggae band in a good, friendly environment .... If I felt that way, I knew others must feel that way, too, so I opened my place,” she said. 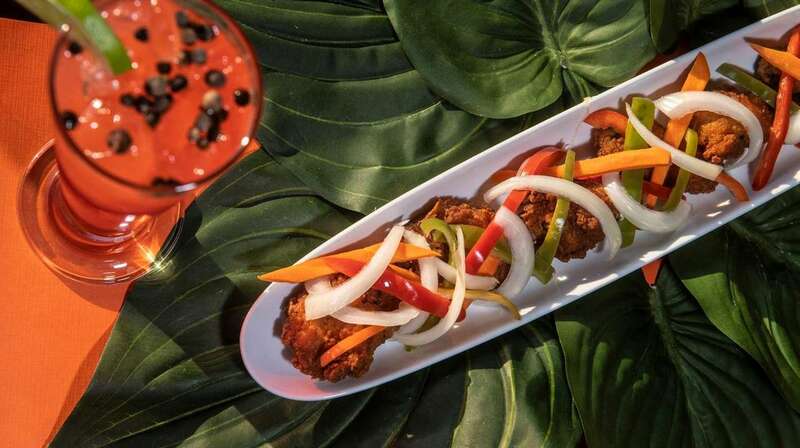 The food at Royale’s restaurant is not just enticing, but a great reminder that much of Caribbean food is not spicy; in fact, on most islands you add hot sauce at the table. At Dunns River, for instance, the oxtail in a rich gravy is more akin to English beef stews than to dishes made fiery by Scotch bonnet chilies. Besides, Royale, like other smart new Caribbean Long Island restaurateurs, gets it. At a diner’s request, the chef will tone down the heat in any dishes that are spicy, and accommodate vegans and vegetarians, too. Caribbeans are nothing if not hospitable. It shouldn’t surprise anyone that Caribbean people and their cuisines are super-adaptable. Their part of the world, after all, has been a culinary crossroads since Columbus landed there in 1492. On one hand, the arrival of Europeans turned out badly for the native peoples: Old World diseases, violence and slavery decimated the Taínos, Arawaks and Caribs. But this so-called Columbian Exchange—which also involved the transfer of crops, animals, populations and ideas—made a huge impact on the global kitchen. Corn, tomatoes, potatoes, pumpkin, chocolate and chilies are among the gifts from the Americas to world cuisine. The Spanish introduced their own staples to the Atlantic Rim: chickens, pigs, cattle, salt cod (aka salt fish, bacalao, moru), wheat, dairy, olives and olive oil, capers, raisins, wine. And the slave traders who brought Africans to the New World also brought the foods of Africa, including black-eyed peas, watermelon, okra and coffee. Over time, as different European powers colonized the islands, new things were added to the pot. Just as Puerto Rico is the trailhead for many Caribbean cruises, the food of that U.S. territory is a good place to start any exploration into island food. Puerto Rican restaurants on Long Island are elusive, though—in general, Puerto Rican food has never had quite the cachet of, say, Cuban food, with its Hemingway-Sinatra vibe—so you’ll have to piggyback on other island cuisines. 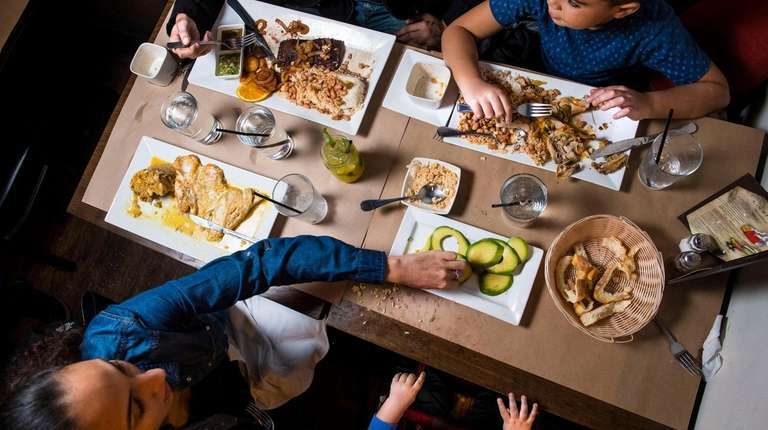 All of our foods are so similar!” said Migdalia Rivera, who, with her mother, Migdalia Maldonado, and brother Eddie Rivera, runs Café Havana in Smithtown, a striking white-tablecloth Cuban restaurant that opened in 2008. It also features Puerto Rican dishes on its extensive menu, reflecting Maldonado’s Puerto Rican roots. “We’re Caribbean; we share the same ingredients and the same flavors and the same values.” Not to mention a love of café culture. Under tropical ceiling fans in dining areas studded with woven cane screens and other elegant colonial touches, Café Havana offers up Cuban classics such as black beans and white rice, churrasco (grilled skirt steak) with sides of yuca and sweet or savory fried plantains, and a robust ropa vieja—skirt steak that’s been simmered to tenderness before being shredded and braised with bell peppers and onions. On the Puerto Rican side, the chicken-and-rice dish called arroz con pollo could have been delivered direct from San Juan: A classic case of culinary harmony, it has just the right subtle notes of ají dulce (a tiny, mild pepper) and culantro (sawtooth coriander). Mofongo, garlicky mashed plantains, a banana relative that is cooked much like potatoes, comes in an all-savory version, made with unripe (green) plantains, or given some sweetness with the addition of ripe (yellow- or black-skinned) plantains. 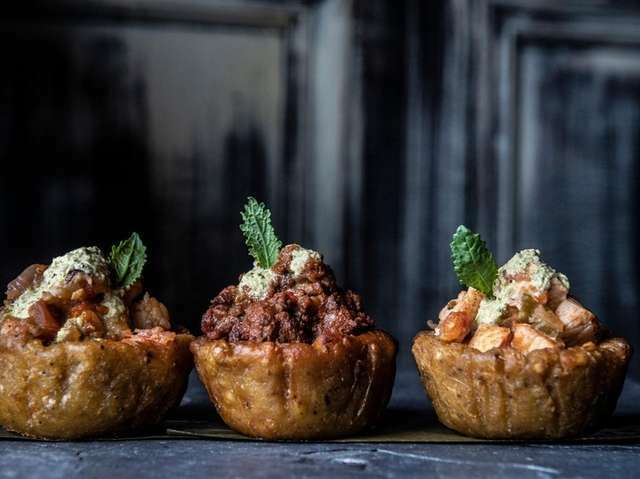 But where a traditional mofongo would contain pork cracklings, Café Havana opts for a lighter touch. “There are many people who for religious reasons don’t eat pork, so we eliminated it from the mofongo,” Migdahlia Rivera explained. “We wanted to be open and welcoming to everyone.” Even the beans are meatless, and the flavor is still great. Café Havana also adds tropical flavor where you might not expect it. At the restaurant’s weekend brunch, coconut gives the pancakes sass, and the French toast gets a silky richness from coquito, Puerto Rican–style eggnog. 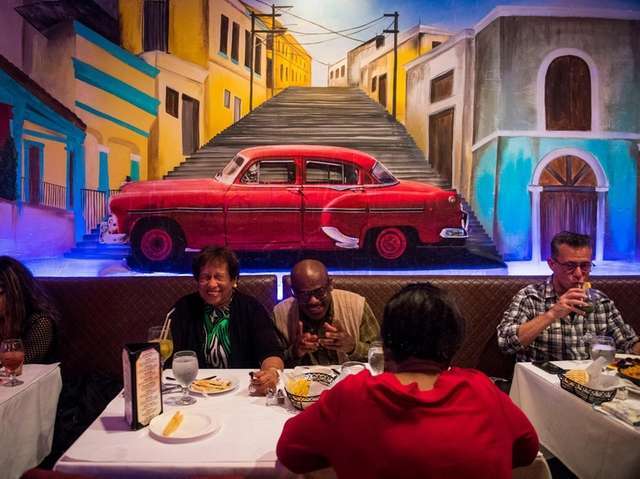 Cuban food, served with generous helpings of art and ambience—not to mention a Tropicana show and salsa dancing—also makes a splash at The Cuban in Garden City. That’s where Willy Martínez, better known as the CEO of the local Mexican food chain Margaritas, has been showcasing the cuisine and culture of his native island since 2016. There’s no way you can miss the place: Right out front is a fleet of gleaming, meticulously restored ’50s Chevys that shout Havana. Inside, servers in straw fedoras and crisp white guayabera shirts salsa around the tables carrying trays of sparkling cocktails complete with sugar-cane swizzle sticks. As a Cuban, I want the customer to feel like they are in Cuba. It’s the cars, the colors, the signs, the artwork; it is all making people experience the Cuban-ness,” said Martínez. Like the islands of Cuba and Puerto Rico, the Dominican Republic shares the same geographic part of the Caribbean basin, was under Spanish colonial rule and employs similar cooking traditions. The first Dominican restaurants on Long Island were owned by the late René Ramírez, who opened the legendary Sabor Dominicano in Freeport and Dominican 4 in Farmingdale, among many others. Outfitted with steam tables and linoleum, they were all exceedingly modest places in neighborhoods with large Hispanic populations. The second Ramírez generation, in the form of René’s son Tony, wanted to bring Dominican food to everyone. And in 2014 he did just that, opening Casa del Campo in North Babylon, with a modern bar area and lots of comfortable, good-looking seating. There is no steam table in sight. Instead, almost everything comes cooked to order from a kitchen that is fragrant with simmering homemade stocks and freshly chopped herbs. His father died just a month later and never had the chance to see how the food he helped introduce to thousands of Long Islanders took off in North Babylon. 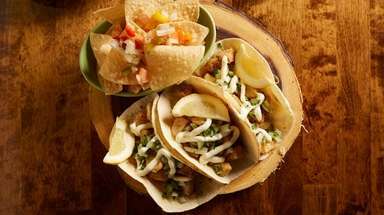 Customers come for the chicken strips, which are crisp, juicy and spicy; mounds of fluffy white rice and rich black beans; garlicky pork that’s fall-apart tender; highly seasoned seafood. On Sundays, they line up (the wait can be up to two hours) for earthy, herby sancocho, the king of stews. A hearty mélange of chicken, pork and beef simmered with root vegetables, it’s a happy marriage between a Spanish pork-and-bean olla podrida and a Taíno pepperpot. “We represent freshness, we don’t use commercial seasonings, so you taste all that in our sofrito, which is our foundation: onion, red and green peppers, oregano,” he said. The concept of sofrito—a mix of aromatic vegetables that is sautéed in lard or oil—is a culinary technique that came from medieval Spain and Portugal. 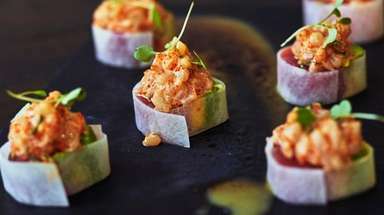 The flavor base, which may be embellished with herbs, spices, chilies or pork in some form, is incorporated into all manner of Caribbean and Latin American dishes. The Dominican Republic shares the island of Hispaniola with Haiti. Since the 2010 earthquake, the Haitian population on Long Island has increased, and with it the number of dining choices. Making the biggest impact is tiny yet mighty 21-seat Gingerbites in Huntington Station. Owner Marie Michele Destil was born in Port-au-Prince, moved to New York at 14, and then to Long Island 20 years ago. After a career as an executive for Estee Lauder, she decided to bring her passion for cooking into the kind of setting she herself liked. So almost three years ago, she and her children opened Gingerbites. The big chalkboard wall with elegant lettering, frondy greenery, bright color acents and cute little tables make it a bistro with tropical charm, as you might expect from the French-influenced Caribbean. Each dish is carefully crafted. 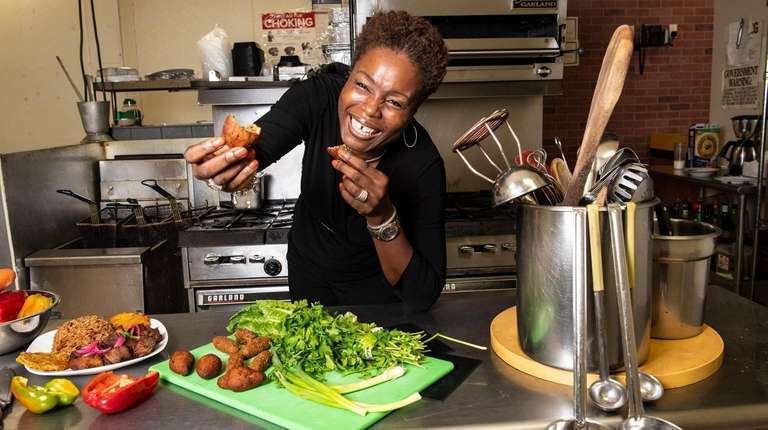 The akra—fritters made of malanga, a starchy root vegetable—and kibbeh—a bulgur croquette from her childhood—are presented with homemade sauces and vegetables. Special treats include griot (pronounced “gree-oh”), pork shoulder marinated with Scotch bonnet chilies and citrus, then simmered until tender before being fried until beautifully crisp. No wonder it’s the Haitian national dish. Goat is another favorite meat on many tiny, hilly Caribbean islands—the animals take up little space and are hardy and easy to feed, making them a sensible source of protein. And if you haven’t tried it, Gingerbites is the place to do so. 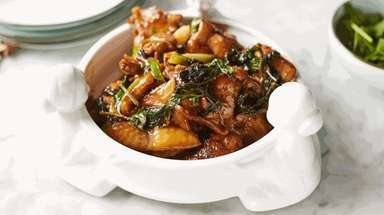 Destil brings out the mildness of the meat in an understated way, with seasonings that include scallion, garlic and thyme. Topped with the chili-laden pickled-vegetable condiment called pikliz (“pick-lees”) and served with coconut rice, red beans and fried plantain, it is an excellent introduction to Haitian food, as is lambi— conch stewed in a zesty Creole sauce. 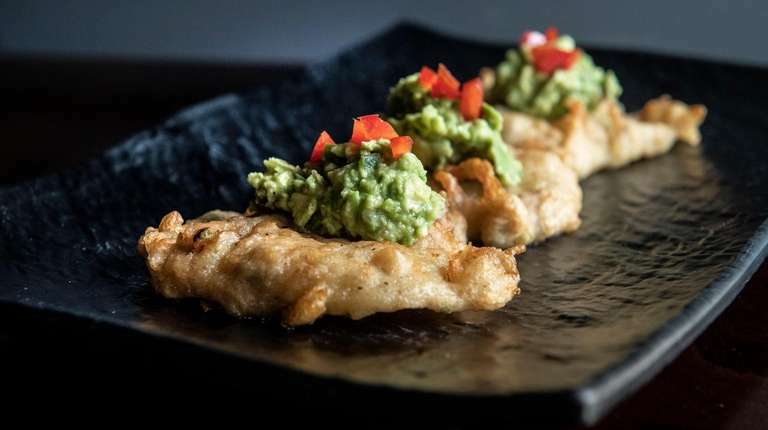 Salt fish (salt cod), a centuries-old staple of the world’s seafaring and coastal peoples that infuses simple dishes with a savory richness, appears in the form of fritters topped with that quintessential New World side, avocado. Escovitch, a variation on a Mediterranean escabeche (meat or fish in a piquant marinade) is paired with an American favorite, chicken wings. Jerk chicken looks perfectly at ease with a mesclun salad and tart cranberries. And those jerk seasonings—clove, cinnamon and allspice—add a little something to linguine à la vodka as well. “That’s what people need to take away,” says Royale. “It’s spices and flavors and influences from so many different places. 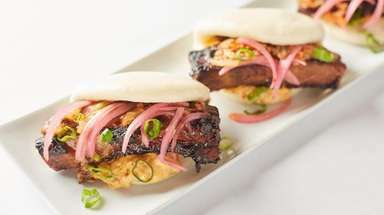 It’s all authentic flavors, but we’ve got a little fusion going on.” And so it goes. For a quick taste of the islands on the cheap, get yourself over to one of the many Caribbean lunch joints on Long Island. They are mostly takeaway establishments, but also have cooks in the kitchen making dishes to order. Here is a handful of places to try. Steam table aside, here you’ll also find a decent dining area, so a sit-down meal is an option. Popular choices include the chicken soup, which will cure whatever ails you; bolitas de yuca (fluffy yuca croquettes with cheese); and anything stewed. The lunch special is just $6.99. If you like a big breakfast, try the mangú, a plantain mash, with sausage and fried cheese. At this bare-bones takeout joint near Hofstra University, you’ll find great food cooked to order. The jerk chicken and the curry goat are both outstanding and come with rice, sautéed cabbage and plantain on the side. It’s not known for its customer service, but at around $8 for a delicious grab-and-go meal that can easily feed two, let it slide. The Cana Bowls come with a choice of rice,a side and a protein (the fried pork belly is amazing, and there is goat on Fridays). Hot sauces are made in house. On the cool side is the Dominican potato salad, creamy and bright in flavor, and the three-bean salad, sparked with cilantro and lime. Dominicans are known for their fruit frappes. Try Morir Soñando, a combination of milk and orange juice. and no seating, while in the evenings, on the other side of the strip mall, there is a dine-in establishment with a nice bar. At the storefront, there’s a wide selection of roti, and the fish dishes are handled with TLC. Try any of the escovitch fish offerings (especially the fillet, if you want to avoid any bones), and remember to order a side of steamed vegetables to go with. Sunday lunch includes ackee and salt fish, the Jamaican national dish, and it’s a fabulous way to start the day.